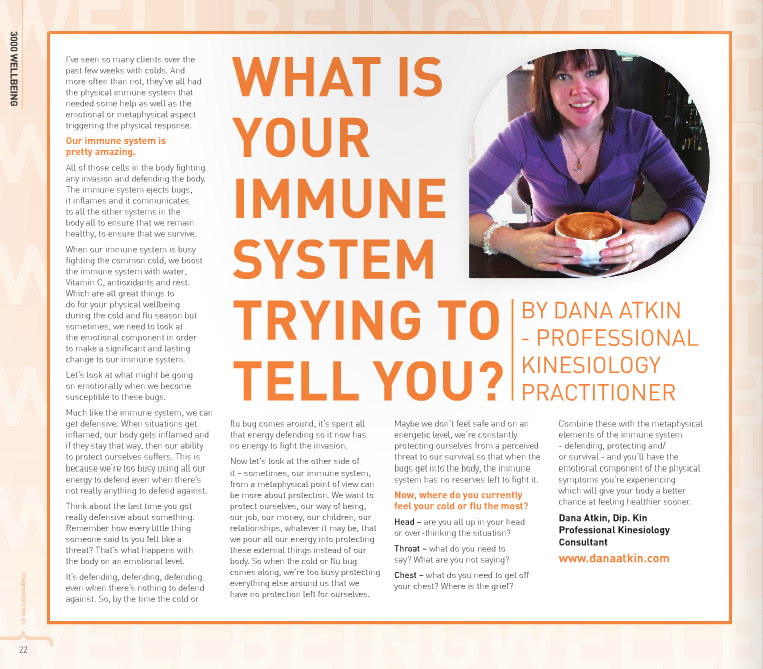 What Is Your Immune System Trying to Tell You? Okay, So here is the August issue of the Wellbeing Article in the 3000 Melbourne Magazine from yours truly all about the metaphysical elements that might be going on with your common cold. I’ve added a recent addition (thanks largely to a few questions I’ve received in response to this article and of course the cold I am currently dealing with). Enjoy. I’ve seen so many clients over the last few weeks with colds. And more often than not, they’ve all had both the physical immune system that needed some help as well as the emotional or metaphysical aspect triggering the physical response. Our immune system is pretty amazing. All of those cells in the body fighting any invasion and defending the body. The immune system ejects bugs, it inflames and it communicates to all the other systems in the body all to ensure that we remain healthy, to ensure that we survive. When our immune system is busy fighting the common cold, we boost the immune system with water, Vitamin C, Antioxidants and rest. Which are all great things to do for your physical wellbeing during the cold and flu season but sometimes, we need to look at the emotional component in order to make a significant and lasting change to our immune system. Let’s look at what might be going on emotionally when we become susceptible to these bugs. Much like the immune system, we can get defensive. When situations get inflamed, our body gets inflamed and if they stay that way, then our ability to protect ourselves suffers. This is because we’re too busy using all our energy to defend even when there’s not really anything to defend against. Think about the last time you got really defensive about something. Remember how every little thing someone said to you felt like a threat? That’s what happens with the body on an emotional level. It’s defending, defending, defending even when there’s nothing to defend against. So, by the time the cold or flu bug comes around, it’s spent all that energy defending so it now has no energy to fight the invasion. Now lets look at the other side of it – sometimes, our immune system, from a metaphysical point of view can be more about protection. We want to protect ourselves, our way of being, our job, our money, our children, our relationships, whatever it may be, that we pour all our energy into protecting these external things instead of our body. So when the cold or flu bug comes along, we’re too busy protecting everything else around us that we have no protection left for ourselves. Maybe we don’t feel safe and on an energetic level, we’re constantly protecting ourselves from a perceived threat to our survival so that when the bugs get into the body, the immune system has no reserves left to fight it. Now, where do you currently feel your cold or flu the most? Head – are you all up in your head or over thinking the situation? Throat – what do you need to say? What are you not saying? Chest – what do you need to get off your chest? Where is the grief? Combine these with the metaphysical elements of the immune system (Defending, Protecting and/or Survival) and you’ll have the emotional component of the physical symptoms you’re experiencing which will give your body a better chance at feeling healthier sooner. When we resist the natural flow of life, we can put all lot stress on ourselves. Stress causes our body to use our Vitamin C reserves which is why we often get unwell when we’re stressed. Where in life are you defensive? Where in life are you being over-protective? Where/what in life are you resisting? Temperature all over the shop – Hot & cold / yes & no? Where are you not making up your mind?